Hirose Financial is a broker that offers trading through its proprietary online platform LION Trader and the MetaTrader 4 (MT4) system. The brokerage makes for an attractive proposition for those wanting to trade in FX and LION binary options. This review of Hirose will highlight both the benefits and the drawbacks, including fees, trading platforms, mobile apps, regulation, and more. LION are however, currently not accepting traders from the UK or EEA. See our brokers list for UK friendly options. Hirose promises floating spreads, which vary depending on your account type. On MT4 they can be around 1.9 pips on the EUR/USD pair, while spreads on LION Trader for the same currency pair are around 0.8 pips. This second quote is particularly attractive when compared to competitors. Hirose users can also benefit from commission-free trading with both accounts, as the firm collects its remuneration through the spread. Whether live or paper trading, you will have the choice of two platforms, LION Trader and the industry standard MetaTrader 4 system. 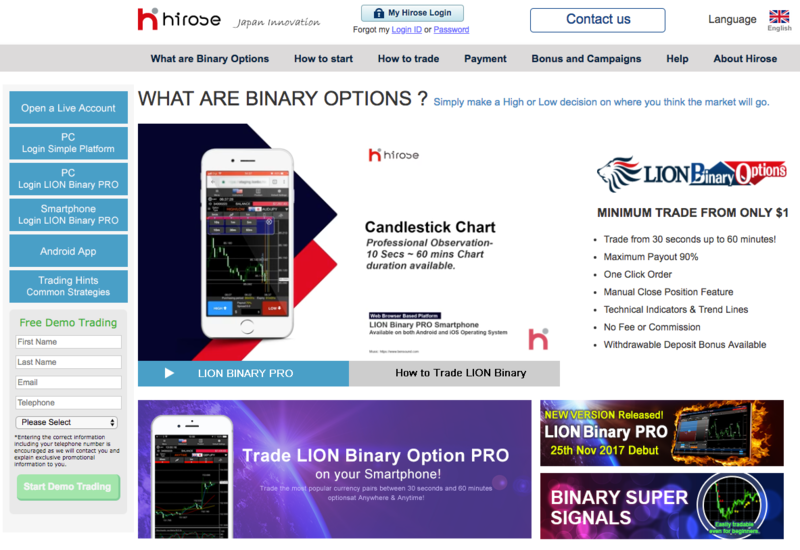 Hirose products, such as LION binary options, have helped shape their proprietary trading platform. However, the platform is actually based on the Act Forex system, enabling trades over numerous terminals. Customer reviews are mostly positive in terms of the platform offering. You have over 50 built-in custom indicators, plus trading bots. Hirose also uses Oracle Coherence, which is an in-memory data grid which aims to enhance execution performance. On top of that, user reviews like that the platform is clean and straightforward to navigate, while free downloadable strategies make it ideal for novice traders. The ability to place trailing orders even when you close the platform is also a useful feature. Overall, the platform is a solid choice for traders of all experience levels. It is particularly effective for LION binary options traders and if you are scalping or hedging. Note if you’re worried your desktop won’t meet hardware requirements, you can also sign into the web-version of the platform. Hirose’s LION Trader uses a straightforward toolbar system to make conducting market analysis and placing orders hassle-free. All you need to do is select the sell/buy button to open or close a position. You will then be able to open a trade, while all open trades will appear in the ‘Open positions’ tab. You can close a position by hitting the ‘Close position’ tab. Then simply select the position and hit ‘OK’ to close. You have the option to place an opening stop or limit entry order when you click on the sell/buy button. Simply hit the Stop button to set a Closing stop order or trailing-stop. If you hit the Limit button you can set a Closing Limit order on your current position. Selecting the Modify button enables you to alter the price. Hit Remove to cancel a current order. If you want to activate an alert, hit Price Alert. A sound and a pop-up box will then ring and appear. In addition, you can always head to their Education section for a detailed manual on using your LION Trader platform. Hirose has been careful not to make the mistake some have in forex and binary options broker reviews, which is not offering the popular MT4 platform. The system is fantastic for experienced traders because it comes with an advanced charting package and an extensive range of indicators. Furthermore, it promises all the capabilities you need to back-test your potential strategies. The MT4 platform also promises automation capabilities. You get a range of EAs to choose from. The other advantage of the MT4 system is that there is a wealth of resources online to help you get the most out of the platform. Entering and exiting positions on the MT4 platform is straightforward. Simply head to the Order window. 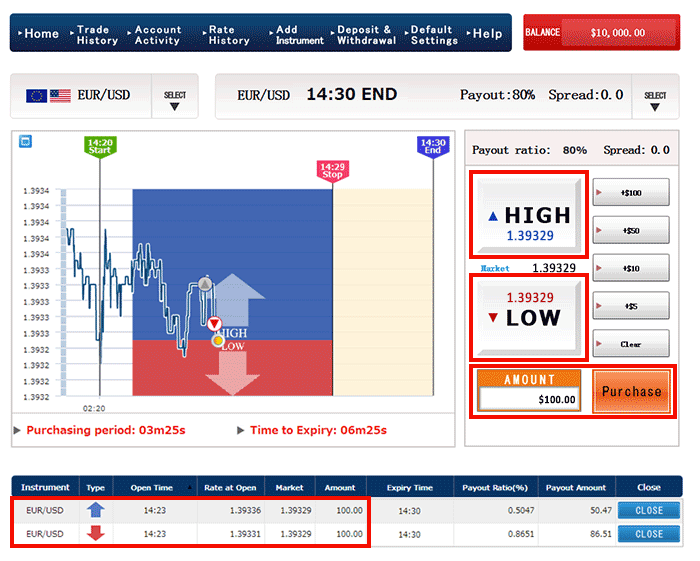 You can do this by double left clicking on an FX pair in the Market Watch window. You can then choose an order size and hit either Sell by Market or Buy by Market to execute. Then just hit OK in the confirmation window. Alternatively, right click on your chart, hit Trading and then select New Order and follow the same instructions. You can view your trade in the Terminal Window in the Trade tab. Here you will also be able to view key information around Stop Loss, Take Profit Levels, Balance, current P&L and Margin levels. 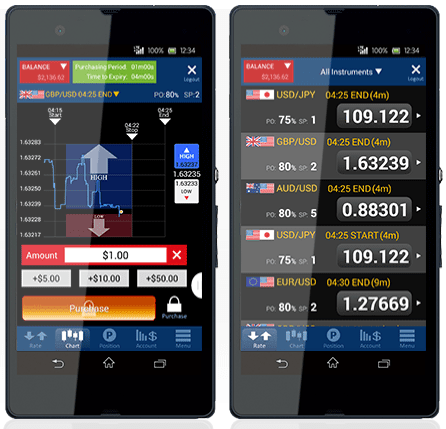 Once you sign up and have your Hirose UK login details, you will also have access to mobile trading apps. There are mobile apps for both iOS and Android users. So you have all the tools you need to craft strategies for trading in LION binary options and forex. Overall, mobile app reviews are positive. You have a collection of all the tools and resources you need to enter and execute trades. Both the options also allow for a smooth transition from the LION Trader and MT4 desktop applications. It is also worth noting reviews were quick to highlight an improvement in market coverage. With LION Trader, you get access to 50 currency pairs. With the MT4 system, you get 46 currency pairs, including the four major pairs, GBP/USD, AUD/USD, USD/JPY and EUR/USD. However, you only have High/Low options. The payouts on the binary options reach 90% which is comparable with the leading regulated binary brokers. Note transfer times may vary. Also, you can contact Hirose via live chat, telephone or email if you have any payment queries. Hirose Financial promises a number of useful additional resources for trading LION binary options and forex. Their education centre includes general trading guides. You can also find an in-depth user manual for both the LION Trader and MT4 platforms. Reviews also note there is plenty of guidance on conducting technical and fundamental analysis. In addition, forex traders will enjoy the glossary and basic guidance on setting up FX trades. All Hirose users need to do is head to the official website and select Education from the top menu. All have free access to these resources and can utilise them while entering and exiting your positions. You can also select the Tools tab from the main menu. There you will find comprehensive video tutorials on how to get set up and work your platform. These training videos will also walk you through account management. While LION binary offer a solid, basic setup, their unavailability to traders across Europe is obviously a “show stopper” for anyone residing there. There are also few trading options, with only the High / Low trade available.